Below you will find a list of all the Action Casino bonuses - offered to new players. The right side offers a casino overview (click to scroll through the images). Casino Action is headlined by one of the largest free play bonuses ever created. The multilingual Microgaming destination is a member of the Casino Rewards group, so there's plenty of money to throw around. Bonus codes have basically been re-invented in order to attract even more players to the betting fold. Together with 490 games and 16 progressive jackpots, with a combined prize pool of over C$5 million; players at Casino Action can cash-in on a 97% payout rate. Gamblers seeking a mobile platform compatible with their iPad, iPhone or Android tablet or handset, can tap into the all-round action on the mobile site. The gambling portal is a major hit with Canadian bettors. In fact, the 2014 big winners list is cluttered with players from Canada who, collectively, have lifted hundreds of thousands of Canadian dollars playing slots at Casino Action. The lucky punters hail from all corners of the country, with multiple residents of Montreal, Quebec City, Edmonton and Calgary striking it rich. We chatted to the host and he alluded to a second Yukon gold rush, but with players panning for credits instead of gold! English and French speaking locals can enjoy mother tongue betting sessions and support, while deposit methods, freely available in Canada, are part of the online package. 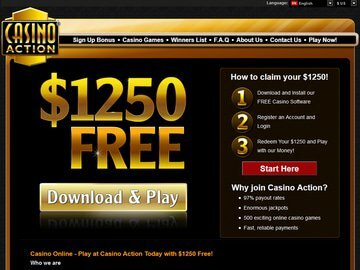 The big bucks Casino Action bonus online is the $1,250 free play sign-up bonus. On registration of an account, players have instant access to the free to play loot, and an hour in which to accumulate as much money as possible. Winnings are capped at $100 and the bonus can only be used on selected slots, table games and video pokers. It's a great way to experience the software and functionality of the site, and find the casino games that really appeal to you, without 'breaking da bank'. There are no codes to redeem or wagering requirements to fulfil, so you can get down to the onscreen action right away. Mobile players at Action casino will have to set their sights slightly lower, as the sign up bonus is a conventional 100% match bonus up to $100. Players at both the online and mobile client are occasionally offered additional bonus codes and promotions. Keep checking your inbox on your desktop, laptop, iPad, iPhone or Android handset for current bonus codes. No deposit bonuses, free spins and cash backs are part of the group's promotional package. Microgaming is known for its extensive games library, creative titles, new releases and big paying progressive jackpot network. 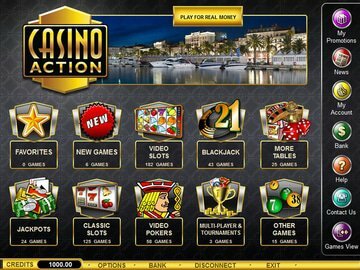 Action customers online have access to 490 games, most of which are slots. Roulette, blackjack and video poker are also on the games menu. The entire site is available as a free software download, and players can easily customise the playing portal by changing the language or currency they intend playing in. Mobile Casino Action supports all handheld digital devices, so you'll be able to access great Microgaming titles via your Android, iPad or iPhone casino with a quick swish, tap or pinch of the fingers. All the games have been optimised for the small screen and feature exclusively under the Microgaming Go label. Although the games menu is much smaller on mobile than online, you'll still be able to enjoy the free spins, bonus rounds and game features of high hit rate mobile slots that include Tomb Raider, Thunderstruck and Mermaids Millions. Jacks or Better video poker and Gold Series European blackjack and roulette are part of the portable pack. As a Microgaming casino, you can expect secure banking, complete privacy and independently assessed fair gaming. Deposit methods are both mainstream and new generation, with web wallets, credit and debit cards and pre-paid cards accepted payment processes. Play is available in Canadian dollar, Euro, British pound and US dollar. Players from Canada can make deposits in quick time with Visa, Visa Electron, Mastercard, PayPal, Citadel and uKash. Customer support is available 24/7 in 16 languages including French. You can contact the casino via Instant chat facilities, email and a dedicated toll free number in Canada. The mobile client is not as multilingual, as support services are only available in Swedish, German and English. The contact points, however, are the same as the online version. The support staff are highly trained to deal with all your enquiries, from technical and banking issues, to how to redeem a casino bonus code. Casino Action is clearly a firm favourite with Canadian players and the hefty free play sign up bonus is likely to attract even more. The games and promotions are available on mobile and online, gambling is supported in both official languages, and CAD is gladly accepted. If you're looking for a full-rounded betting site that's secure, trustworthy and packed with potential, Casino Action is a remarkably safe bet.